It often feels as though we live in a litigious society, one in which few lawsuits are considered frivolous and any perceived slight can be addressed in a court of law. As a result, certain terms and phrases have become practically too dangerous to wield. For example, few financial services companies will dare to use the term “guarantee” for, well, anything. There really are no guarantees in finance, and claiming to guarantee anything, like approval for a credit product, is simply asking for angry customers (and a potential lawsuit). In other words, the closest you’ll get to a guaranteed installment loan is finding a lender with flexible credit requirements that specifically caters to those with bad credit. While every credit application comes with risk, the right lender can make it almost guaranteed. Personal installment loans can be used for a wide range of financing needs, from auto repairs to debt consolidation. They’re repaid through monthly payments over the course of the loan term, which makes them ideal for large purchases that you need to pay off over months or years. Most personal installment loans are unsecured loans — meaning there’s no collateral — which can make them hard to find (and expensive) if you have bad credit. Online lending networks, like those below, can be a good way of finding a flexible lender with reasonable terms. See official site, terms and details. An important thing to note is that online lending networks are not direct lenders. Instead, lending networks partner with direct lenders so they can connect with borrowers from across the country. When you choose an offer from an online lending network, you’ll be redirected to the lender’s individual website to see the full loan agreement and to complete the loan. Once you’ve started working with a lender, the lending network’s role in the process is done. 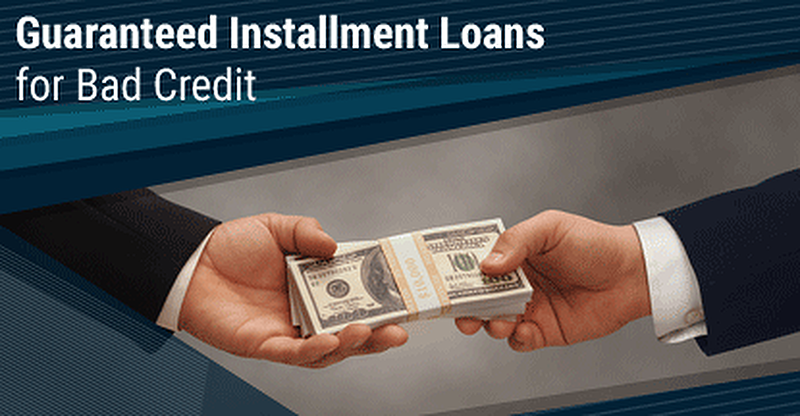 In many ways, a credit card line of credit can operate much like an installment loan. For example, both products allow you to break your repayment up into multiple payments over time, but both also have a required minimum payment each month. Credit cards, however, differ in a few key ways, the first of which is reusability. Once you’ve paid off your balance, you can use your credit card again and again for short-term financing. Given the typically small limits of subprime cards, this makes credit cards often ideal for smaller purchases you can pay off quickly. Another valuable way credit cards differ from loans is that most credit cards provide the ability to enjoy 0% short-term financing. It’s called the grace period and nearly all cards — even subprime and secured cards — offer this feature. In essence, the grace period is the time between when your statement closes and when your bill is due. If you pay off your entire balance during the grace period, you won’t be charged any interest fees on that balance. The grace period isn’t good for everything, however. First, some cards may not have one, so check your card’s terms and conditions or your cardholder agreement to verify that your card has a grace period. And, the grace period doesn’t apply to every type of transaction. If you make a balance transfer or a cash advance, for instance, your transaction will likely start accruing interest the moment it posts to your account (you’ll also typically be charged a fee for these transactions, so read the terms and conditions). Although your business can establish and build its own business credit profile, your personal credit can have a big impact on whether you’re approved for a business loan, especially for small businesses without millions of dollars in revenue. So, funding your small business with bad credit takes a little homework to find a decent lender. Just remember that, as with consumer loans, business loans for people with bad credit will tend to be more expensive than loans offered to consumers with good credit. Compare your options to ensure you get the best possible rates. StreetShares offers multiple products based on your financing needs and qualifications. Its term loans can be obtained in amounts of up to $100,000 for qualified applicants, and term loans of up to three years are available. Those interested in a StreetShares loan or credit line can check for pre-approval before applying. While not a guarantee, being pre-approved can be a good indicator of whether you’ll be accepted when you apply. Kabbage provides small business lines of credit, with qualified applicants receiving credit lines of up to $250,000. To qualify, you need to have been in business at least one year and have an annual revenue of $50,000 or have made $4,200 a month for the last three months. Kabbage credit lines can be accessed through the Kabbage mobile app or through the desktop site. You can also use your credit line to make purchases by using the Kabbage Card. QuarterSpot offers small business loans of up to $200,000. The qualifications include a personal FICO score of at least 550, to have been in business for at least one year, and make at least $16,000 in revenue per month for the past three months. QuarterSpot funding can be obtained in as little as 24 hours, though some loans may take longer to disperse. There is no prepayment penalty for paying your loan in full before the end of your term. In some cases, small business loans for bad credit will report to the consumer credit bureaus, meaning responsible use of your business loan could help to improve your bad credit. The most important step is to always make at least your minimum required payment before the due date each month. While not as robust as the consumer credit card market, the number of business credit cards from which to choose has grown steadily over the years. These days, businesses (and owners) of all types can find a credit card designed to fit their needs. That being said, the number of business credit cards available for applicants with bad credit is still fairly limited, with most options being secured cards that will require an upfront deposit, though a fair credit score may net you an unsecured option. One of the few unsecured business credit cards that considers applicants with less-than-stellar personal credit, this card offers 1% cash back on purchases and no annual fee. The Wells Fargo Business Secured Credit Card will require a deposit to secure your credit line, but it can be a good way to establish and start building that all-important business credit. You’ll even earn rewards as you do it, with 1.5% cash back on every purchase. The BBVA Secured Visa® Business Credit Card will require at least a $500 deposit to open and your available credit will be equal to 90% of your deposit amount. With this card, you’ll build business credit while earning rewards on every purchase. Your BBVA Secured Visa® Business Credit Card will also provide free employee cards, a host of online account services, and special Visa Business benefits. Responsibly using your new card can be a good way to improve both your personal and business credit scores. Boosting both your personal and business credit scores is the best way to improve your ability to qualify for the best business credit cards. Certainty is great. Nothing is more reassuring than the absolute knowledge that what you’re about to do is guaranteed to be successful. Unfortunately, there are few guarantees in life — and fewer still in finance, where failed guarantees are swiftly met with legal documents. No, the best you can do to find a guaranteed loan or credit product is research, research, research. When you have bad credit, the key to being approved for an installment loan — whether for personal financing or business expenses — is to find the right lender. Look for one that frequently works with less-than-stellar credit profiles and is comfortable with the financial risk that can entail.